Sweden is largely focused on exports. After facing deflation in 2015, (which made exports more expensive) the Swedish economy grew 3.5% in 2016. The forecasts for 2017 show a slowdown in GDP growth and a 1% increase in business failures. These expectations may be triggering Swedish respondents’ decreased use of credit terms in B2B sales. After a sharp increase in sales on credit terms in 2016, the total value of B2B sales on credit in Sweden decreased again this year. However, compared to Western Europe (domestic: 42.6%; foreign: 35.1%), Sweden maintains a credit-friendly approach. On average, 52.1% of the sales to domestic B2B customers were transacted on credit. This is significantly higher than the 43.5% of sales made on credit to foreign B2B customers and shows a tendency similar to that shown by most respondents in Western Europe. 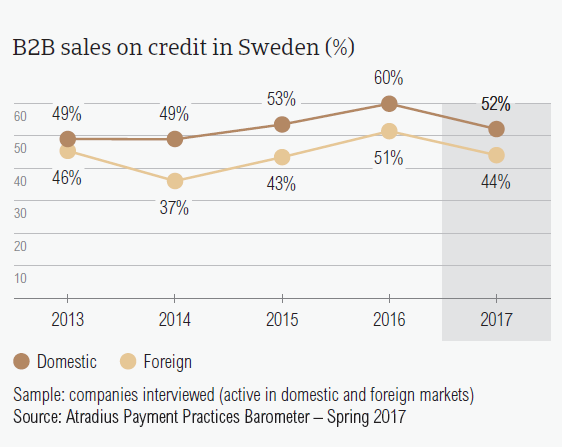 In 2017 Swedish respondents sold less on credit than one year ago (domestic: 60%; foreign: 51%). This eight percentage point drop in the percentage of domestic credit sales was the second most significant in Western Europe after that registered in Denmark (12 percentage points). The 2017 average percentages of sales made on credit terms are similar to those of 2015, a year in which Sweden was facing deflation. Similar to what was observed in 2016, respondents in Sweden reported some of the lowest rates of overdue B2B invoices in Western Europe. Respondents in Sweden (domestic: 81%; foreign: 71.4%) seem to have experienced late payments of B2B invoices less often than their peers in Western Europe (domestic: 91.4%; foreign: 84.2%). 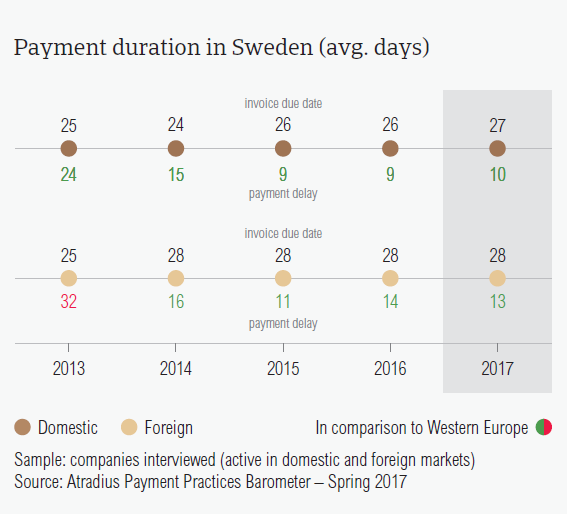 Moreover, late payment of invoices in Sweden was reported to occur less frequently in 2017 than in 2016 (domestic: 87.2%; foreign: 75.6%). 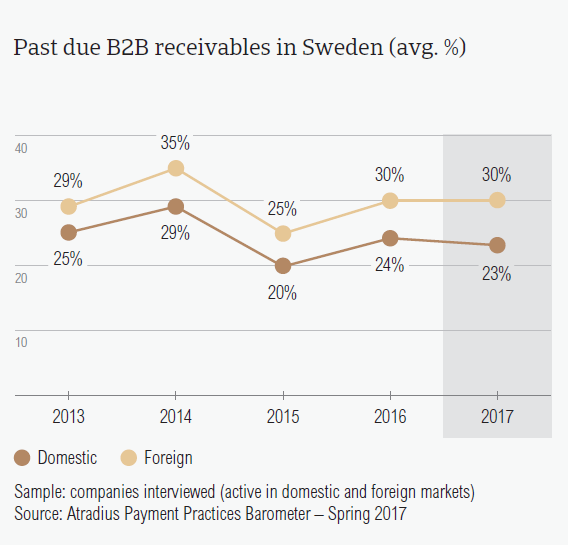 Overdue B2B invoices occurred more often with the foreign customers of our Swedish respondents (30.2%) than with their domestic customers (23.1%); Western Europe showed the opposite trend (domestic: 41.9%; foreign: 39.4%). In 2017, the Days Sales Outstanding (DSO) figure posted by Swedish respondents averages 30 days and is four days shorter than in 2016. The DSO average in Sweden is the second shortest in Western Europe after that in Germany (25 days) and is notably shorter than the regional average (44 days). Almost 80% of respondents in Sweden do not expect a change in their companies’ annual DSO over the coming 12 months. A low percentage of respondents (11.1%) expects a slight increase. The average payment terms extended by respondents in Sweden remained relatively unchanged in 2017. They are also some of the shortest in the region. In 2017, domestic B2B customers were given, on average, 27 days from the invoice date to settle their invoices. This is one day longer than the average domestic payment term in 2016 and one day shorter than the average payment terms given to foreign B2B customers. Despite the minor increase on the domestic market, the average payment terms in Sweden remain notably under the average payment terms extended in Western Europe (domestic: 33 days; foreign: 31 days). Respondents in Sweden reported changes in the average payment delays of their domestic and foreign B2B customers. Domestic B2B customers delayed payments, on average, 10 days (2016: nine days). In contrast, foreign B2B customers delayed their payments 13 days, on average (2016: 14 days). Among the Western European countries surveyed, respondents in Sweden have the shortest invoice to cash turnaround time (around 40 days to convert B2B receivables into cash). This is one day longer than one year ago. 40% of respondents in Sweden cited buyers’ use of outstanding invoices as a form of financing as the primary reason for payment delays by their domestic and foreign B2B customers. The percentage of Swedish respondents stating the above-mentioned key payment delay factor is almost twice the average of Western Europe overall (domestic: 28.2%; foreign: 23.9%). Other frequently cited reasons for payment delays by domestic B2B customers were: insufficient availability of funds (37.2%) and the complexity of the payment procedure (20%). In respect to payment delays by foreign B2B customers, liquidity constraints, the complexity of the payment procedure and inefficiencies of the banking system were each cited by 26% of Swedish respondents. 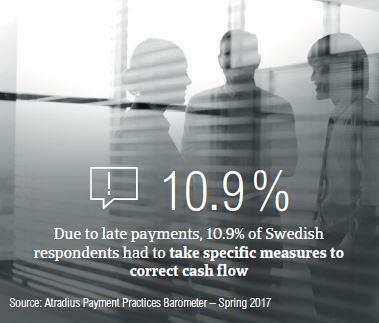 Asked about potentially negative consequences of late payment, Sweden had the highest percentage of respondents (66.4%) who said that past due invoices did not have a significant impact on their businesses. Of those respondents who mentioned consequences, 10.9% said that they needed to take specific measures to correct cash flow and 10.3% said that they had to postpone their own payments to suppliers. Among the Western European countries surveyed, Sweden had the highest percentage of respondents (57.3%) who said that they will continue with their current mix of credit management tools even in the face of developments such as Brexit, the slowdown in Asia and US protectionism. 12% of respondents stated their intention to increase protection against the above-mentioned developments. This is lower than the average posted in Western Europe overall (18%). Swedish respondents are likely to increase checks on their buyers’ creditworthiness (16.8%), their monitoring of buyers’ credit risk (14.9%) and bad debt reserves (11.1%). Only 8.4% said they would increase their use of credit insurance and 8.5% their use of collections agencies. 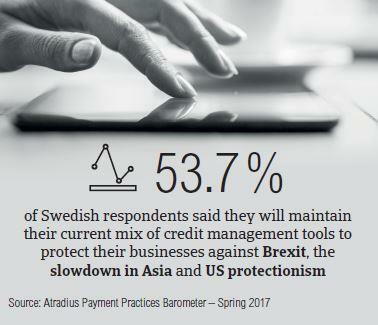 The most likely actions that Swedish respondents would take to protect their businesses from the impacts of Brexit, the slowdown in Asia and US protectionism include increasing checks on their buyers’ creditworthiness (Brexit: 16.3%, the slowdown in Asia: 13.1%, US protectionism: 21%) and monitoring their buyers’ credit risk (Brexit: 14.7%, the slowdown in Asia: 13.4%, US protectionism: 16.5%). Fewer B2B receivables were written off as uncollectable this year (0.7%) than in 2016 (1%). The total average value of B2B receivables written off as uncollectable in Sweden (0.3%) is half of that registered in Western Europe overall (0.6%). Similarly to what was observed in previous surveys, uncollectable receivables consisted primarily of domestic write-offs (domestic: 0.6%; foreign: 0.1%). This year, the largest proportion of uncollectable receivables originated from the consumer durables, business services and construction sectors. 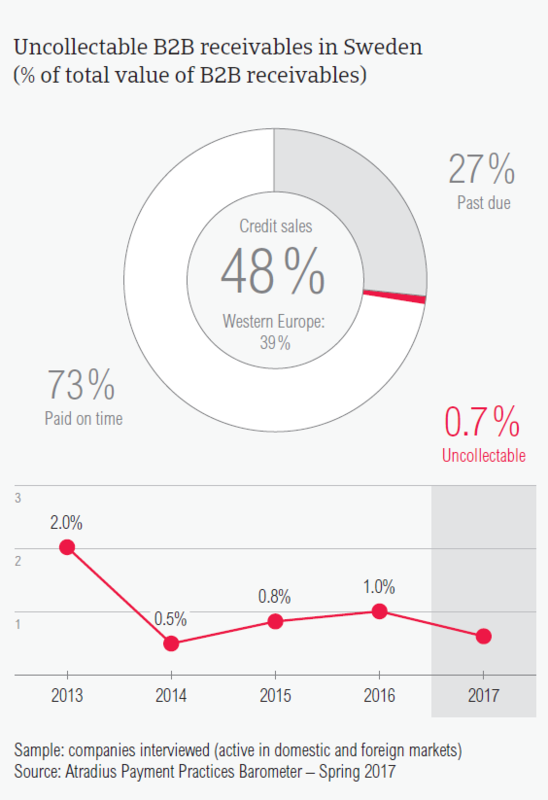 B2B receivables were written off as uncollectable mainly because the customer went bankrupt (60%) and because of failed collection attempts (23.3%). Most respondents in Sweden (68%) do not expect changes in the payment behaviour of their domestic and foreign B2B customers over the coming 12 months. B2B customers of respondents in the agriculture (39 days), business services (33 days) and construction materials sectors (28 days) enjoyed longer payment terms than the country average (28 days). On the other hand, B2B customers in the food (18 days) and financial services industries (23 days) were asked to fulfil their payment obligations faster. 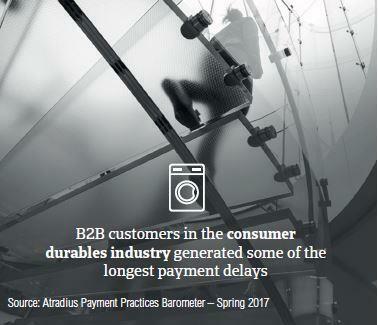 Swedish respondents said that B2B customers in the services (87 days), business services (85 days) and consumer durables (79 days) sectors generated the longest payment delays. The main reasons for payment delays in the above-mentioned sectors are the same as those mentioned in Sweden overall: liquidity constraints (reported in the services sector by 42% of respondents; business services sector: 39% and consumer durables sector: 38%) and buyers’ use of outstanding invoices as a form of financing (services: 38%, consumer durables: 33%, business services: 33%). Asked about behaviour changes of their B2B customers over the coming 12 months, only 11% of respondents in Sweden believe that there might be a slight worsening. The risk of a downturn in the domestic real estate market could dampen higher growth prospects in the furniture and domestic appliances segments in 2017.